Typically, the patients who undergo femoral endarterectomy (FEA) have significant systemic disease and comorbidities. As such, they are at high risk for perioperative morbidity and mortality. Regional anesthesia is frequently employed in addition to monitored anesthesia care (MAC) or general anesthesia (GA) to enhance hemodynamic stability. Its benefits include blunting of sympathetically mediated responses to surgical stimulation, improved perioperative pain control, and reduced perioperative opioid requirements and opioid-related adverse effects. Regional techniques for FEA include neuraxial anesthesia (spinal or epidural) and deep nerve blocks (i.e., lumbar plexus nerve block). However, these techniques are regularly contraindicated in this patient population most commonly from recent administration of chemical anticoagulation. When neuraxial and deep regional anesthesia techniques are contraindicated, other peripheral nerve blocks can be employed. Conventionally, for patients undergoing FEA at our institution where neuraxial and deep nerve block techniques are contraindicated, a transversus abdominis plane (TAP) block to anesthetize the ilioinguinal (IL) and iliohypogastric (IH) nerves was performed and supplemented with MAC. This anesthetic plan regularly resulted in inadequate intraoperative and postoperative analgesia. This was evidenced by intraoperative patient movement, frequent need to convert to GA due to intraoperative sympathetically mediated response to surgical stimulation, and uncontrolled postoperative pain. We postulated that patients experienced inadequate perioperative analgesia as a key sensorineural area that is commonly disrupted during FEA was not completely covered with blockade of the IL and IH nerves alone. This was producing a consistent anatomical “gap” in sensorineural blockade. The femoral branch of the genitofemoral (FBG) nerve provides sensation to the skin of the femoral triangle and to the underlying femoral vessels located within the femoral sheath. This anatomical location is commonly disrupted during FEA and does not receive sensory supply from the IL and IH nerves [Figure 1]. Hence, we believe that the TAP block alone provides inadequate analgesia for the FEA procedure. We anesthetize the FBG nerve using an ultrasound-guided suprainguinal technique. The ultrasound probe is positioned parallel and immediately superior to the inguinal ligament. The medial edge of the ultrasound probe is in proximity to the lateral edge of the pubic tubercle. At this location, the goal is to visualize the external iliac artery (EIA). The nerve is usually not visible but is located within the same fascial sheath as the EIA. The needle is advanced in plane from lateral to medial until the needle tip is visualized immediately lateral to the EIA. After negative aspiration, approximately 10 mL of 0.5% ropivacaine is administered. The local anesthetic should be visualized surrounding the EIA., A TAP block was performed on the ipsilateral side under ultrasound guidance using an in-plane technique. Spread 20 mL of 0.5% ropivacaine between the internal oblique muscle and the transversus abdominis muscle was observed under direct visualization of the needle. From 2015 to 2018, 30 select patients have undergone FEA after receiving preoperative single-shot FBG nerve blocks and TAP blocks. Supplemented with MAC, all 30 patients who underwent the aforementioned nerve blocks for FEA experienced adequate intraoperative and postoperative analgesia, as defined by intraoperative hemodynamic stability during surgical stimulation, minimal intraoperative and postoperative opioid requirements, and well-controlled postoperative pain. The overall improved perioperative analgesia noted with addition of the FBG nerve block to a TAP block for FEA, may be explained by the additional sensory neural blockade of the skin of the anteromedial thigh and of the femoral vessels located within the femoral sheath. 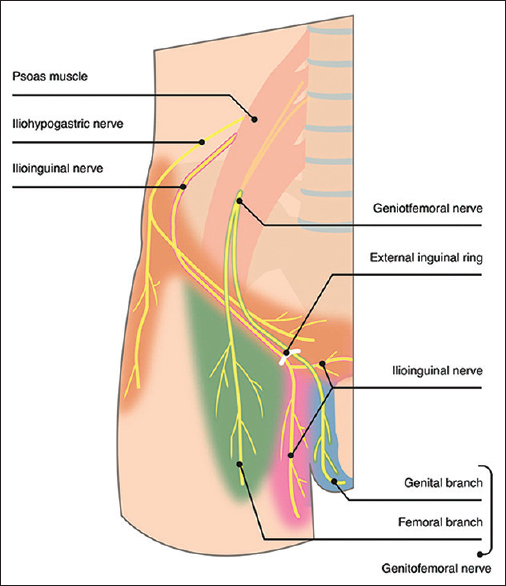 This anatomical location specifically receives sensory innervation from the FBG nerve. These structures are disrupted during most FEA procedures and, when not anesthetized, likely contribute to perioperative pain and sympathetic stimulation via activation of the nociceptive pathway. According to our observation, for FEA, blockade of the FBG nerve in addition to coverage of the IL and IH nerves may provide enhanced and more reliable perioperative analgesia when compared to TAP block alone. Horlocker TT, Vandermeuelen E, Kopp SL, Gogarten W, Leffert LR, Benzon HT, et al. Regional anesthesia in the patient receiving antithrombotic or thrombolytic therapy: American Society of Regional anesthesia and pain medicine evidence-based guidelines (Fourth Edition). Reg Anesth Pain Med 2018;43:263-309. Sasaoka N, Kawaguchi M, Yoshitani K, Kato H, Suzuki A, Furuya H, et al. Evaluation of genitofemoral nerve block, in addition to ilioinguinal and iliohypogastric nerve block, during inguinal hernia repair in children. Br J Anaesth 2005;94:243-6. Fekry DM, Megahed NA, EL-Lakany MH, Yakout MM. Ultrasound-guided ilioinguinal, iliohypogastric, and genitofemoral nerve block versus spinal subarachnoid blockade for inguinal hernia repair. Res Opin Anesth Intensive Care 2017;4:29-34. Soneji N, Peng PW. Ultrasound-guided pain interventions – A review of techniques for peripheral nerves. Korean J Pain 2013;26:111-24. Al-Alami AA, Alameddine MS, Orompurath MJ. New approach of ultrasound-guided genitofemoral nerve block in addition to ilioinguinal/iliohypogastric nerve block for surgical anesthesia in two high risk patients: Case report. Open J Anesthesiol 2013;3:298-300.